Plant flowers in two gardens to help develop fraction sense. The two gardens act as number lines, from 0 to 1. 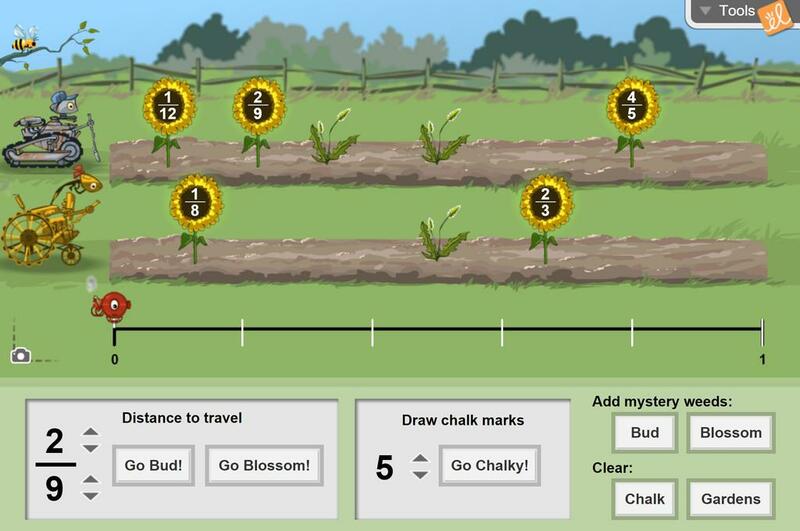 Use the flowers in the gardens to compare fractions and to explore equivalent fractions. Chalk marks can be drawn to divide the garden into equal sections. Estimate the locations of fractions on a number line. Students explain why the position of flowers gets closer to 1 as the numerator gets larger. Screen Shots of the Chalky's Number Lines up to 6ths. Suggest using this when using the Gizmo in a whole-... (more)class lesson where students are comparing and ordering fractions. Also suggest laminating or putting in sheet protectors so students can write on them when comparing fractions. This is a game I created for students to play using the gizmo. They roll dice to see how many weeds to pl... (more)ant in their partner's garden. Then their partner has 3 minutes to pull them up. The remaining weeds count as points. After 5 turns the game is over and the lowest score wins! A quiz for students to test their knowledge on comparing and ordering fractions. They are allowed to use... (more) the Gizmo on one part of the test. Bud and Blossom can be used to extend students' understanding of fraction equivalence and ordering. This gizmo would work great for review before our comparing fractions assessment. This Gizmo is awesome. It has just the right amount of difficulty. I love the way fractions are represented and compared on a number line. This Gizmo gives students a fun way to learn to compare fractions. A great way for students to understand ordering and comparing fractions.